Robert Heinlein's Starship Troopers is beloved of military men. Many of Jerry Pournelle's books have the same audience. 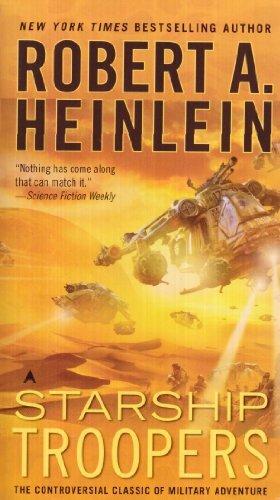 What is really remarkable about Heinlein as an author is that he managed to write three cult classics with non-overlapping audiences: Starship Troopers, The Moon is a Harsh Mistress, and Stranger in a Strange Land. Heinlein is remembered so fondly by so many fans in part because of his personal warmth, but also because just about everyone can find a great book written by him that entertains ideas they find congenial. Even when the books are something of a treatise, they tend to be fun to read. John doesn't mention it here, but Heinlein also liked to drop subtle hints that his protagonists were diverse. Rico, for example, is Filipino, despite Paul Verhoeven's casting choices. But you don't find any hints of this until the end of the book, and it can be easily missed. It was probably a fun game for him. Most of Heinlein's work comes from before the American culture wars, and the protean nature of his writing makes it difficult for anyone to really claim him for their side. John cites a 2004 op-ed in the New York Times by John Tierney to the effect that the culture wars didn't exist outside of a few political elites. There was something to this, twelve years ago, but it is rapidly becoming less so. Unfortunately, this is all predictable. The victories of the Cultural Left have produced exactly the kind of opponents they claimed to be fighting against, but stronger and more popular because the Left hasn't been particularly magnanimous in victory. However, the further prediction is that the ultimate victor in the race to Empire will be the Economic Left and the Cultural Right, most likely after some unpleasantness. John didn't go as far as predict Brexit in 2004, but he did intuit that electoral success for the UKIP or similar nationalist parties would slow or halt the unification of Europe. Over the weekend, I viewed the DVD (was it ever in theatrical release?) of Starship Troopers 2: Hero of the Federation. This film was produced and directed by Jon Davison. Though it is set in the same imaginary world as the "Starship Troopers" film released in 1997, which was directed by Paul Verhoeven, and uses the same special-effects, there is little other connection. The only actor in the second film who appeared in the first is Brenda Strong. Even she plays another character, since her character in the first film was cut in half by a closing air-tight door. Film directors and science-fiction writers just are not in the same business, so it is idle to complain that a film adaptation does not follow a novel closely enough. Still, the Verhoeven film seemed to go out of its way to falsify the book by Robert Heinlein, on which it was nominally based. Though essentially a boot-camp story, the novel Starship Troopers served as a platform for speculation about how a libertarian society could maintain the cultural resources necessary for self-preservation. Heinlein's solution was to make voluntary national service (not even necessarily military service) a prerequisite to the franchise and full citizenship. The "voluntary" feature was key. In Heinlein's libertarian Utopia, even soldiers on campaign could resign if they so chose. Verhoeven flipped that around, turning the world of the film into a place where "the Army runs the government," and soldiers are repeatedly threatened with death if they try to quit. In general, in fact, Verhoeven seemed oddly keen to ensure that no unprogressive ideas should reach the audience. For instance, Heinlein discusses the subject of mixed gender infantry units and suggests that they had been tried but did not work. The different military services in the book are segregated by gender. Verhoeven will have none of that: the film features mixed showers and lots of Amazonian women in form-fitting combat gear. I suppose this development of the background story represents progress; the Verhoeven movie implied that the bugs were misunderstood. "If the two presidential candidates this year were John McCain and Joe Lieberman, you'd see a lot more crossover and less polarization," said Professor Fiorina, mentioning the moderate Republican and Democratic senators. He is the co-author, along with Samuel J. Abrams of Harvard and Jeremy C. Pope of Stanford, of the forthcoming book, Culture War? The Myth of a Polarized America. "The bulk of the American citizenry is somewhat in the position of the unfortunate citizens of some third-world countries who try to stay out of the cross-fire while Maoist guerrillas and right-wing death squads shoot at each other," the book concludes. "Reports of a culture war are mostly wishful thinking and useful fund-raising strategies on the part of culture-war guerrillas, abetted by a media driven by the need to make the dull and everyday appear exciting and unprecedented." The facts here are plausible, but I wonder about the interpretation: Fiorina seems to suggest that there is no Culture War, unless of course you consider the forces that are fighting it. In any case, Tierney's article does not presume to suggest where the Times itself lies on the spectrum of Shining Path to Falangist. Actually, at the risk of devoting too much space to the Times, yesterday's issue was notable for two breaks with ideological conformity in the Book Section. But what is most odd is Frank's refusal to consider the idea that there might be such a thing as legitimate cultural grievances. The only legitimate interests, he believes, are material ones. ''By all rights,'' he tells us, ''the people in Wichita and Shawnee and Garden City should today be flocking to the party of Roosevelt, not deserting it.'' But instead, the poor fools have been led astray...Frank's book is remarkable as an anthropological artifact. Although not terribly successful at explaining the cultural divide, it manages to exemplify it perfectly in its condescension toward people who don't vote as Frank thinks they should. Perhaps even more remarkable, the Times let David Frum, the co-author of An End to Evil, write a favorable review of Walter Russell Mead's latest book, Power, Terror, Peace, and War: America's Grand Strategy in a World at Risk. That book is a defense of the conceptual basis of the Bush Administration's foreign policy. Mead is the Henry A. Kissinger senior fellow in United States foreign policy at the Council on Foreign Relations, and so, no doubt, a lonely man in professional circles. But I don't want to get started here, since I plan to review the book. After results from London, the North East, Yorkshire and the Humber and Wales, the Tory vote is down 7% and Labour has fallen 6%...With turnout at a record high, the main winner seems to be the UK Independence Party, whose vote has doubled to 13%. From what I can tell, the UKIP is not a crypto-fascist group, like some nationalist parties I could name. They seem to be moderate people who just want out of the European Union. Similar Euroskeptic parties on the continent did well in the EU parliamentary elections. The election results are not so dramatic as to alter the way the parliament will function, but you have to wonder what will happen to the unification project if, someday, Europeans elect the equivalent of the Gingrich Congress.